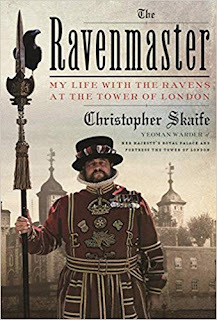 I just finished reading The Ravenmaster: My Life with the Ravens atthe Tower of London, and I recommend it wholeheartedly. You may know the legend – if the ravens ever leave the Tower, the kingdom will fall. If you don’t, you’ll find out more about it in this book, along with folklore, history, and superstitions about ravens. You’ll also learn about Yeoman Warder Christopher Skaife, who is responsible for caring for the ravens. In The Ravenmaster, he tells us all about the birds, each with their own distinct personality, and their routines. What they eat, where they sleep, how they will steal your snacks, especially Pringles, how intelligent they are, their pecking order and social structure. His affection and respect for his charges show clearly. They have an inspiring partnership. Skaife is honest and funny. A really enjoyable book.